First let’s get the terminology right: in Glasgow the students cross-country team is called the Hares and Hounds, in Edinburgh they only have one hare – so it’s Hare and Hounds. Both answer however to the name of The Haries! The following series of profiles was written by Colin Youngson who knew them all well when he was teaching and living in Edinburgh and his admiration for the team is boundless. Edinburgh University Hare and Hounds nurtured so many fine athletes, many of whom have been profiled here under ‘Marathon Stars’ or ‘Elite Athletes’ or ‘The Chasers’. Consider this impressive list: Martin Craven, Donald Macgregor, Fergus Murray, Alex and Jim Wight, Alistair Blamire, Gareth Bryan-Jones, Andy McKean, Jim Dingwall and Phil Mowbray. But what about the supporting cast: very good runners who contributed to great success in the Edinburgh to Glasgow Relay or the Scottish National Cross-Country Championships? 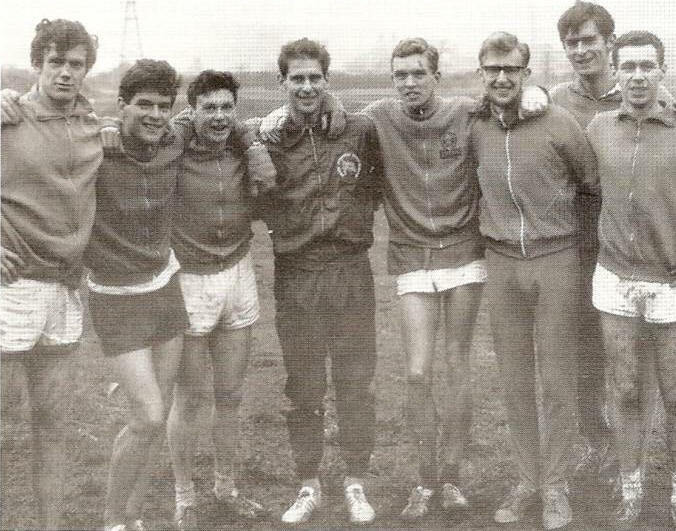 EU H&H were usually the best long distance running team in Scotland from 1965 to 1968. They won the E-G from 1965 to 1967 and the National Senior from 1966 to 1968. The potential was clear in 1963 when they won the Scottish Junior cross-country title with a team including Chris Elson and Roger Young. Frank Gamwell was part of the outfit which won again in 1964; and the students made it a hat-trick when Roger Young took part again, along with Ian Young. Willie Allan was one of the 1965 E to G record breakers; and Ian Hathorn was in the 1966 E to G triumph. These seven athletes will be profiled briefly. Roger Young won two Scottish Junior Cross-Country team golds, and in 1965 finished second individual, defeated only by the immensely talented Ian McCafferty. In the E-G he was in the team which finished second in 1964, and was second fastest on Stage Eight in 1965 when EU won and broke the course record. Roger achieved eighth place (second team counter behind Fergus Murray) in the 1966 National. On the track he ran 14:20.6 for three miles. Chris Elson won a Scottish Junior Cross-Country gold in 1963, finishing seventh individual. In the Senior National he obtained team bronze in 1965 and gold in 1967. In the E-G Chris won silver in 1964, when he was second fastest on Stage Five. When EU triumphed in 1965, he was the second fastest again this time on Stage Four, behind only Andy Brown’s fantastic stage record. Then in both 1966 and 1967, Chris was fastest on Stage Eight in the winning team. He broke the stage record in 1966. On the track, he seems to have concentrated on the mile with a best time of 4:10.9. Frank Gamwell was thirteenth in the 1964 Scottish Junior Cross-Country when his team won the title. In 1966 he was one of the victorious Edinburgh University runners in the Senior National. Previously he won silver in the 1964 E-G and then gold in 1965 when he was fastest on Stage Five. As a summer athlete, Frank ran nearly everything: one mile (4:19), two (9:13.4), three (14:17.8) and six miles 29:33.0), steeplechase (9:35.4) and eventually the marathon (2:35:14). Ian Young also ran for Springburn Harriers. He was a counter for Scotland in the ICCU Junior Championships in both 1964, when he finished twenty second, and in 1965, when he was seventeenth. In the 1965 Scottish Junior he had achieved sixth place. As a Senior he was fifteenth in 1967 when EU won team gold. In the E-G Ian was fastest on Stage Eight when EU won the silver in 1964. Then in 1966, winning team gold, he was second fastest on Stage Five, only one second slower than Alastair Johnston’s record (for Victoria Park) Ian’s team won again in 1967, when once more he was second-fastest on Stage Five, one second slower than Aberdeen’s Steve Taylor. In 1968, although EU could manage only seventh, Ian was easily fastest on Stage Five when he broke the record. As a track athlete, Ian Young had many fierce battles with Alistair Blamire over three miles. Ian’s best time was 14:01.6 and he won a silver medal in the 1967 AAA Championships. Willie Allan won Senior National team golds in 1967, with EU, and in 1969 with Edinburgh Southern Harriers. He ran Stage Three in the famous 1965 record-breaking Edinburgh University E-G team. For several seasons Willie was a good steeplechaser with a best of 9:13. Nowadays, relatively speaking, he is running better than ever, winning British cross-country and road titles in the over-60 age-groups. Ian Hathorn’s finishing sprint for nineteenth place proved vital in the Senior National in 1968. He ended up one place in front Aberdeen’s Joe Clare and EU won the team title by a single point. Ian could cover 880 yards in 1:54 while Joe was a 2:18 marathon runner. In the E-G, Ian’s best run was in the EU team that won in 1966 when he broke the record on Stage Three. He also won gold in 1967. After University, many Edinburgh University graduates joined either ESH (Craven, Macgregor, Murray, Blamire, Bryan-Jones) or EAC (Alex and Jim Wight, McKean, Dingwall). But who were among the most prominent team mates for these stars and others such as Southern’s Allister Hutton and John Robson and EAC’s Jim Alder, Adrian Weatherhead, Doug Gunstone, Jim Dingwall, Sandy Keith and Lindsay Robertson?